Suitable for men and women alike, this delicious chocolate flavoured shake is ideal as a substitute for one of your meals at any time of the day. Just enough carbohydrates are used to fuel your workout and replenish depleted glycogen. Add 2 rounded scoops (55g) to 200-300ml of cold water (or skimmed milk). Mix thoroughly in a blender or a shaker for about 30 seconds. Take 1-3 servings daily. Protein Blend: Consists of Whey protein (Milk), calcium caseinate (Milk), soy protein isolate and egg albumin powder, Maltodextrin, MCT (Medium Chain Triglycerides), Cocoa powder, CLA (Conjugated linoleic acid), L-Carnitine, Boron, Selenium, Fructose, Calcium Phosphate, Sodium Chloride, Aspartame (sweetener), Stabiliser, Vitamin Blend, Chromium Picolinate, Flavourants. This product contains Milk and Soy. Not suitable for pregnant or lactating women or individuals under the age of 16. Do not exceed the recommended daily intake. As with all exercise, nutritional programmes and supplementation, please consult your doctor prior to use. 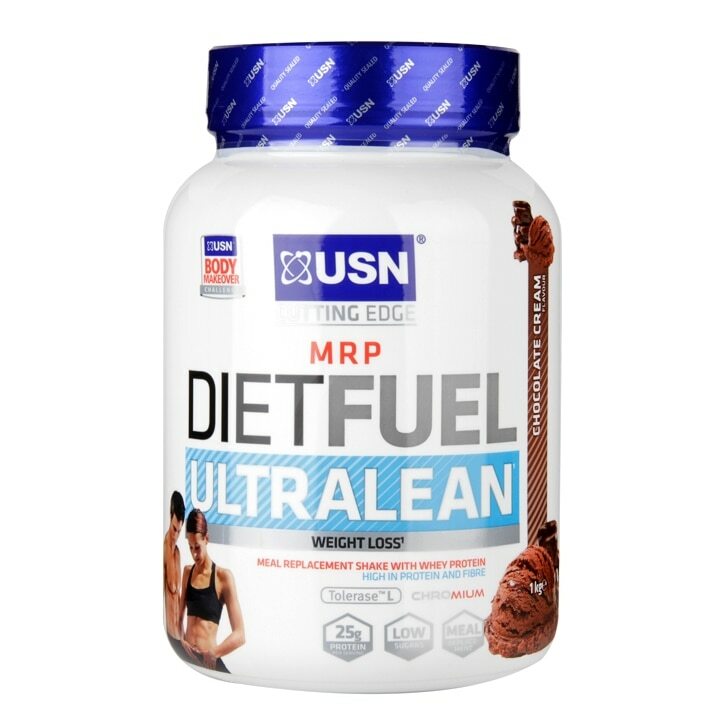 USN Diet Fuel Powder Chocolate is rated 4.3 out of 5 by 65. Rated 5 out of 5 by Nikkilou91 from Great product About half way through, I’m fussy with protein powder drinks but this is the only one I actually enjoy drinking. Rated 1 out of 5 by Dani12xx from Wouldn’t recommend! I brought this as it was on offer. All I can say is I didn’t find it sweet, theres an artificial taste to it which made it worse.